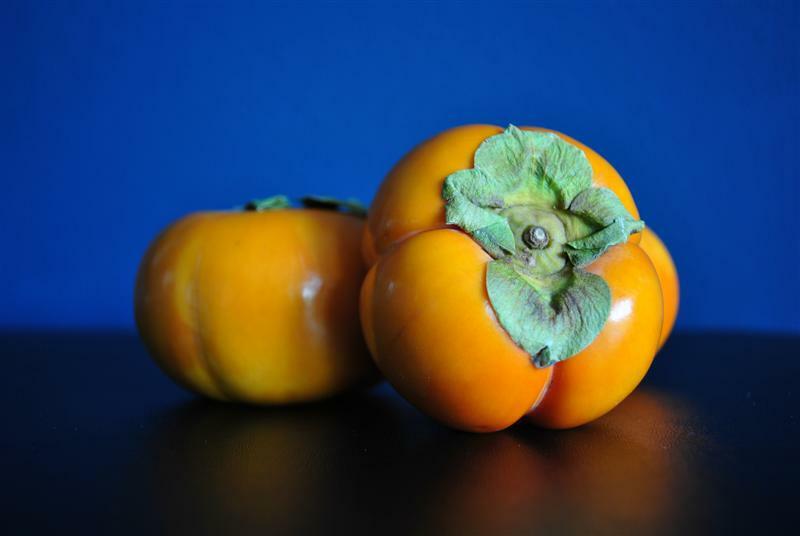 Today’s fruit is one of the most common varieties of Persimmon available, the Fuyu. I have largely avoided the Fuyu review because really, how can I write the letters FUYU without making a reference to one of the most dramatic and effective swear words in existence. Now I know many, if not all of you, are thinking that the “F” word never even crossed your mind when you saw Fuyu and you never once considered saying “F You” instead. That just means you likely do not have the mind of a girl who grew up on the hard streets of Reno (see Reno 911 for proof of this), not that the reference isn’t screamingly obvious. This fruit looks fake to me with it’s shiny sculpted presence and leafy chapeau. It has no give, which makes me wonder if it has had some work done (Shhh. I’m thinking botox). Nonetheless, I think it is just lovely. Pumpkin mixed with raw dough. I guess it smells a little yeasty. This is a relatively firm fruit, which is exactly how you are supposed to eat a Fuyu (unlike a Hachiya for example, which needs to be soft). It has a thin skin, satisfying crunch and is seedless with a nice mild level of juice. Cross between a sweet carrot and a mild papaya with a slight tannic aftertaste. You can wait to eat the Fuyu Persimmon until it is quite a bit more ripe and it gets a bit sweeter, but then it loses that lovely crunch. Also, the raw fruit is sometimes used to treat constipation and hemorrhoids. I do not know, nor do I want to know, how this is done. Please do not leave it in the comments.